Gerald and his wife Linda J. Polley are publishers of "Voices From Spirit Magazine." Speaker Gerald Polley died on July 4, 2,012. Speaker Linda J. Polley now lives in Ellsworth, Maine. Click on the links below to read the miracles listed for those dates. We have just skimmed through our magazines to make this list. There are other things in them that many consider are part of John Lennon's ongoing miracle. We suggest you start reading at V13 N6 and go to the present day. There is just too much for this web site and John wanted us to keep it simple. There is a book that Linda has written about her adventures with John called "Heaven's Hero; My Adventures With John Lennon." We're looking for a publisher. If you know of one contact them. Ask them to get ahold of us! 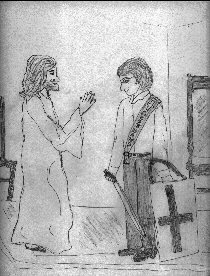 John Lennon receiving his hero's sash from Jesus Of Nazareth, Called The Christ.